Evaluator: A person certified by DSA to administer the testing for one or more badges that is not the Dog Scout or Jr. Scout badge. Certification to administer each badge is earned separately. Note: A person does not need to be the leader of a troop to be a Scoutmaster or an Evaluator, and a person can be an Evaluator without being a Scoutmaster or choose to be only a Scoutmaster. Must demonstrate the ability to teach others, from start to finish, how to complete the requirements of the badge using DSA approved methods. Must agree to uphold the DSA standards of testing and training as outlined in the badge paperwork and this manual. Is aware that only DSA members may earn badges. The badge program started at the first Dog Scout camp in 1995. The patches were iron-on rectangles that were created from a photo of the dog doing the badge activity. Until around 2003, badges could only be earned by attending a Dog Scout camp. And multiple visits to camp were required to earn the designation as Scoutmaster, with more visits needed to be certified to teach and sign badge forms for the badge activities at a camp. 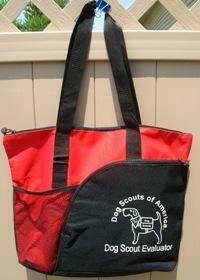 It was around 2003 that the “Worldwide Dog Scout Certification Program” was developed. The new program allowed the Dog Scout badge to be earned outside of camp by having people submit video of themselves and their dogs performing the behaviors required for the badge along with a written test of the handler’s skills. The video was then reviewed by a DSA certified Scoutmaster. Over time, the program has slowly expanded to allow video submissions for all of the DSA badges. More recently, the video evaluation program was expanded further still to include the certification of individuals as Scoutmasters and Evaluators. As with any new program, it has been a learning experience for all involved and has led to an ongoing over-haul of the information available for the badges. As we see how the information is interpreted by people that have never been to a camp and/or have limited experience with some of the badge activities and requirements, we make changes to clarify the intent of the information and badge requirements. This is an ongoing process as more and more people make use of the video certification program and earn more and more of the badges that may not have previously been earned this way. The most common mistake made by new Scoutmasters and Evaluators is thinking the badge testing is minimal and has easier requirements than is the case. The badges are meant to be goals that will take some skills and training to achieve. Each badge includes the training information and a break down of the step by step process of achieving the goal. It is, in most cases, a test of skills meant to prepare the dog and handler for entry level into the sport or activity being tested. In some cases, that has been further broken down into easier steps, like with the Agility series. But standards are, and should be, high. Because the badges do take some work and the standards of earning them are high, it increases their value as a true achievement. A uniform with badges is a testament to the dog’s (and the human’s) level of training and skill and should be a source of pride and respect. The first step to being certified as a Scoutmaster or Evaluator is to learn all you can about the badge you want to be certified to administer by reading all the available material on the Dog Scout website about the activity/badge. 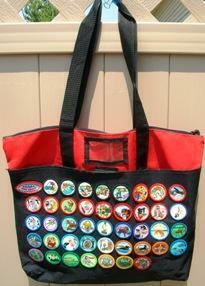 For some badges, the DSA standards for the badge activity may vary slightly from the standards of other organizations. For example, the Dog Scout badge may look similar to the CGC, but the testing for the Dog Scout badge involves more precision and the demonstration of a higher level of understanding. The heeling portion must demonstrate that the dog understands and maintains heel position as opposed to loose leash walking. The leave-it must be done with a really high value food item like a left-over lasagna pan, jar of peanut butter or meaty rib bone. It also includes leave-it with another animal that is not a dog. If you are not sure about something regarding the badge testing, be sure to ask the Certification Program Director. Once you are fully familiar with all the badge components, you’ll want to train your own dog (using DSA approved methods) to do the behaviors needed to earn the badge. This will give you a first hand experience with the badge requirements and you’ll get helpful feedback from a certified Scoutmaster or Evaluator. If you feel the standards used to test you were not as high as you expected based on what you have read here and on the DSA website, please inform the Certification Program Director. Some current Evaluators and Scoutmasters have limited opportunity to do testing of dogs in their area and they could get a bit “rusty”. Without feedback from the folks being tested, we won’t know if this is the case. Annual or semi-annual re-certification testing may be instituted in the near future through our new Quality Assurance Program, to help alleviate this issue and ensure that testing standards are kept high and as uniform as possible. Once you are fully familiar with the requirements and have earned the badge on your own dog, you have a few options for getting yourself certified as a Scoutmaster and/or Evaluator. Because these have slight differences, they will be covered separately. The Dog Scout badge is the foundation for all the other badges and dogs must earn this title before they may submit badge forms for the other badges. DSA is the only organization that tests both the dog’s skills AND the handler’s knowledge. Standards for this title are high, but open to any dog/handler willing to put in the time and effort needed to achieve the requirements. While reactive dogs and fearful dogs may not yet be ready, these issues do not preclude them from passing the test in the future if the owner helps the dog overcome his or her issues using positive training and learns/uses the management skills needed to help the dog feel safe. As a DSA certified Scoutmaster, you are expected to be able to help the dogs and handlers achieve the skills they need to pass the test and/or have behaviorists you can refer them to (and you have verified that they use DSA approved methods). You are not expected to offer training for free. You MAY charge people for training classes/sessions. But you may not charge them a fee for testing and may not require attendance at a training class or session to get tested for a badge. Because the Dog Scout test cannot be completed upon your first meeting with the dog and handler (it must include interaction and observation on at least three days) some Scoutmasters do testing for different components on different days. An example would be sit-down-stay-come on one day, leave-it and greetings on the second day and the remainder of the test on the third day. This allows the testing to be offered at troop meetings or during a troop camp out or over the course of 3 “badge days” you set-up. Don’t forget the handler components of the test. You may have the handler submit their written test answers to you, or set aside time to cover all the handler components and information as a group. If a person/dog is not quite ready to pass, they may try again in the future on the components they had trouble with. It is preferred that the testing be completed within 6 months. You’ll need a way to keep track of which dog/handler has attended and passed each component as well. A master sheet that you keep is highly recommended. This can be a simple table or Excel page that has the list of dogs/handlers on the left and the badge components across the top. As a dog completes the requirements for a component, the box next to their name for that component gets the date added. The check-off sheet available on the DSA website is for each handler to keep track of their own progress if they choose. The requirements for the Dog Scout test are laid out in the “how to get the Dog Scout title” manual and in the pages that accompany the Dog Scout badge on the DSA website. There is a lot to know as a Scoutmaster and if you are also a CGC evaluator, you’ll need to keep the requirements for each clear and separate when you do the testing. We have learned that when people do the testing at camp or at the leadership retreat, the helpful support of other staff and the environment don’t translate well to testing that is done once they get back home. For this reason, the Scoutmaster certification requires a video submission (or in-person evaluation) in your home area using the equipment and area you plan to use for future testing. The leadership retreat and summer camps offer great opportunities to practice your Scoutmaster skills and get helpful feedback from Scoutmaster Trainers that shouldn’t be missed if you have the opportunity to attend. You may also be able to get certified as an Evaluator for one or more badges at these events, if that is offered. So for the Scoutmaster certification, you will need to arrange for in-person evaluation by one of the DSA certified Scoutmaster Trainers, or you will need to submit a video taken on your home turf that shows the Scoutmaster Trainer how you will do the testing for the Dog Scout badge. It should show you putting one or more dog/handler teams through the Dog Scout test (including your instructions to the handler) and be accompanied by your Scoutmaster Written Test answers. Please include, for each component of the test, your evaluation of the team’s performance and if you think it would pass or not (if not, include why). While the videographer should zoom in on the team being tested as much as possible (keeping all of the dog and handler visible), he/she should show YOU when you are giving instructions to the handler. The Scoutmaster Trainer needs to observe your body language and any gestures you use to communicate information to the team. If the team you are testing does not yet have their Dog Scout title/badge, let the Scoutmaster Trainer know. They will then be able to certify the team as well (if they pass) while also watching you for your certification. Once you are certified as a Scoutmaster, you no longer need to submit video or written tests of the people you test. You will be able to sign their badge form for the Dog Scout badge as soon as they pass. NOT BY VIDEO – If you are certified as a Scoutmaster, you are only certified to evaluate people in person. Certifying people though video is another level and takes even more skills than in-person testing where you are able to ask the person questions or have them “try again” on the spot. If you are interested in becoming certified to evaluate people by video, let the Certification Program Director know. SCOUTMASTER TRAINER – This is the highest level of Scoutmaster certification and means you are able to certify others as Scoutmasters. This certification is granted on a case by case basis. Unless you have been granted this level of certification by DSA, you may not certify others as Scoutmasters. The specialty badges are really varied and can be earned in almost any order. A few badges do have prerequisites and you’ll need to verify that the dog has earned the required badge before you sign their form. This can be done by contacting the person in charge of the badges database (Recognition Program Director). Standards for the badges are high, but open to any dog/handler willing to put in the time and effort needed to achieve the requirements. This may take more effort for some dogs and people than for others depending on their skill level. However, not all of the badges are meant for all dogs. If a dog is overweight, too young, or has a condition that makes a badge activity dangerous for the dog, you may need to gently inform the handler and direct them to badges more suited for their dog. The Puissance Jumping badge is an example of a badge that may not be safe for some dogs to perform. Weight pull is another. As the Evaluator, you are expected to know if there are safety concerns for the badge you are testing. But if there are no safety concerns, the badges are open to any dog that has earned the Dog Scout badge/title. If a Chihuahua wants to do carting or a Great Dane wants to do Earthdog (and appropriate sized equipment is available/used) they are welcome to do so! As a DSA certified Evaluator, you are expected to be able to help the dogs and handlers achieve the skills they need to pass the test. You are not expected to offer training for free. You MAY charge people for training classes/sessions. But you may not charge them a fee for testing and may not require attendance at a training class or session to get tested for a badge. Because the specialty badges can be completed upon your first meeting with the dog and handler (such as at a canine sport event) you may test for multiple badges on a single day. An example would be a troop river trip. If you are certified, you could evaluate the attendees for several of the water related badges at that one outing. Don’t forget the handler components of the test though! If a person/dog is not quite ready to pass, they may try again in the future on the components they had trouble with. It is preferred that the testing be completed within 6 months. Because of this, you’ll need a way to keep track of which dog/handler has passed each component and a master sheet that you keep for each badge is highly recommended. This can be a simple table or Excel page that has the list of dogs/handlers on the left and the badge components across the top. As a dog completes the requirements for a component, the box next to their name for that component gets the date added. The check-off sheets available on the DSA website are for each handler to keep track of their own progress if they choose. The requirements for each badge are laid out on the “badges” page of the DSA website. Some badges are more involved than others. If you are unclear on any component, please ask. Certification as an Evaluator is done per badge. So just because you are certified to evaluate for Obstacle 1 does not mean you are also certified for the other Agility badges. Each badge has its own requirements, so an Evaluator trainer needs to see you test one or more teams for that particular badge. You will also need to demonstrate (or include on the video) your O&S (Orientation and Safety) session that includes the training steps and any safety or familiarization information needed by people who have no experience with the activity. This can be filmed separately from the testing and it is preferred that you are giving this info to at least one other person so they can ask questions and get clarification from you as needed. You may also be able to get certified as an Evaluator for one or more badges at Dog Scout camps and the Leadership Retreat, if badge certification and an Evaluator Trainer are available. You may also arrange for in-person certification if you have an Evaluator Trainer in your area or visiting. Please include, for each component of the badge test, your evaluation of the team’s performance and if you think it would pass or not (if not, include why). While the videographer should zoom in on the team being tested as much as possible (keeping all of the dog and handler visible), he/she should show YOU when you are giving instructions to the handler. The Evaluator Trainer needs to observe your body language and any gestures you use to communicate information to the team. If the team you are testing does not yet have badge, let the Evaluator Trainer know. They will then be able to certify the team for the badge as well (if they pass) while also watching you for your Evaluator certification. Once you are certified as a Evaluator, you no longer need to submit video for that badge. You will be able to sign their badge form as soon as they pass the in-person test. NOT BY VIDEO – If you are certified as an Evaluator, you are only certified to evaluate people in person. Certifying people though video is another level and takes even more skills than in-person testing where you are able to ask the person questions or have them “try again” on the spot. If you are interested in becoming certified to evaluate people by video, let the Certification Program Director know. EVALUATOR TRAINER – This is the highest level of Evaluator certification and means you are able to certify others as Evaluators for certain badges. This certification is granted on a case by case basis. Unless you have been granted this level of certification by DSA, you may not certify others as Evaluators. Badge forms are to be completely filled out (top and bottom) before they can be signed by a Scoutmaster or Evaluator. If incomplete forms are submitted with videos, the forms will be returned so they can be resubmitted with complete information. As a Scoutmaster or Evaluator, you may NOT sign any incomplete badge form regardless of promises made by the handler to complete the form. On more than one occasion, those incomplete forms have gotten submitted to DSA that way and then the Scoutmaster/Evaluator hears from DSA. The Scoutmaster/Evaluator is NOT responsible for collecting badge fees and/or submitting badge forms to DSA. Once the form is signed, it is up to the handler to send it to DSA with the badge fee. Scoutmasters and Evaluators do not collect any part of the badge fee from the handler. For Scoutmasters and Evaluators that are evaluating video submissions, if parts of the test did not pass and need to be re-submitted, a $5 fee may be collected as compensation for the extra time spent on video evaluation. The longer the video is the greater the chances that this fee will be requested. As stated above, you may charge a fee to give classes that help people and their dogs learn the skills they need to pass one or more badges. You may NOT require these classes or charge an extra fee for testing. Each new Scoutmaster and Evaluator gets added to a database. The Recognition Program Department keeps track of how many badge forms get submitted to DSA with the Scoutmaster or Evaluator’s signature. Once an evaluator has completed a total of 5 badge evaluations (for any badge), they are eligible for $5 compensation per badge on future evaluations that are not new to that evaluator. The first evaluation for a badge new to that evaluator would not be eligible for the evaluator fee. But when the second evaluation for that same badge is completed (signed badge form submitted), they can start earning $5 per badge form and get the patch for that badge. Once 5 badge forms for a particular badge get submitted, the Scoutmaster/Evaluator will receive a nice zippered shoulder bag and that patch to add to the bag (one per person) at the end of the year, after all totals are in. The Recognition Program Director keeps track of this and a check will be issued by the DSA treasurer. Upon submission of 5 forms for another badge, the Scoutmaster or Evaluator will receive that patch to add to their bag. For example, if the person is certified to evaluate for the Dog Scout badge and Obstacle 1 badge, if Obstacle 1 has 5 forms with their signature on it submitted to DSA, that will earn them the bag and the obstacle 1 patch. Once 5 forms for Dog Scout with their signature are submitted to DSA, they will get the Dog Scout patch to add to their bag. Once a Scoutmaster or Evaluator has gotten the patch for a particular badge for their bag, they start earning $5 for each badge form for that badge with their signature that is submitted to DSA.